The optimal design of the pressure cylinders used in the GASVESSEL depends on different transportation scenarios, which were characterized in an earlier stage of the project. 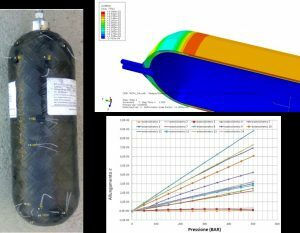 GASVESSEL partner ESTECO is now working on the realization of an optimization platform, through the software modeFRONTIER, to enable the efficient design of the pressure cylinders. Material properties of the composite layers (such as the percentage of fibres, number and orientation of plies). Different models have been prepared to simulate the stress and reserve factor of the cylinder. 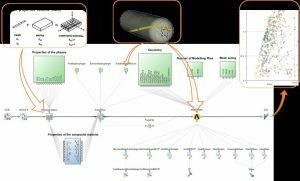 These include FEM (Finite Elements Method) structural models prepared with Ansys and Abaqus by ESTECO, and analytical models prepared in Python by CNGV, on the basis of semi-empirical considerations. The models have been integrated into an optimization workflow through the modeFRONTIER software by ESTECO. Simulations can be run automatically, updating the values of the design parameters through available optimization algorithms, until the specified objectives are optimized. The main criteria considered for the optimization are the minimization of mass on one side, and minimization of fatigue factor on the other side, while satisfying the constraints on the admissible stresses. These two objectives are contrasting because a lighter structure may cause a shorter lifecycle (higher fatigue factor). The preliminary analyses have revealed a range of the design parameters, which can give an optimal compromise between the two contrasting objectives. In particular, it is possible to consider the thickness of the liner between 3 and 6 mm and a composite layer thickness between 3 and 9 cm. This is a promising result in terms of economic feasibility of the process: the more the layer thickness can be reduced, the more the global mass of the cylinder can be minimized, and the more the final gas transportation tariff can be cut down. Currently, ESTECO is aiming to help GASVESSEL partner CNGV to select the final configuration of the vessel, confirming its structural performance with a FEM analysis. In a final step, the application of the software CADWIND will be analyzed, in order to identify the optimal winding parameters, i.e. the layers of fibre-reinforced composite material wrapped around the metal liner.